You know how when you’re dragging a window on the iPhone and you let go it’ll move a little bit with its momentum before coming to a stop? Well, I decided that’d be a cool thing to implement with Preceden. Two nights and about four Hot Pockets later, I finally got it down. You see? That’s why we persist in our investigations, why we struggle so desperately for every bit of knowledge, stay up nights seeking the answer to a problem, climb the steepest obstacles to the next fragment of our understanding, to finally reach that joyous moment of the kick in the discovery, which is part of the pleasure of finding things out. 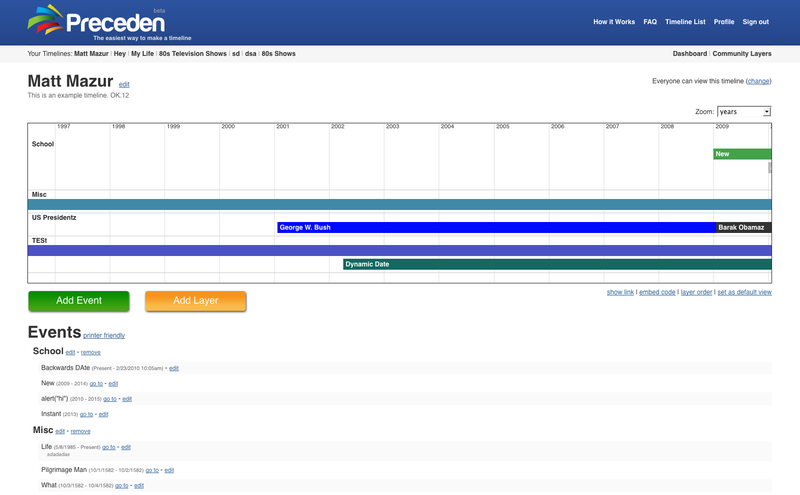 Using Preceden, students will create a timeline of important events (causes) leading up to World War II. To see a sample, click here. The password is —. The timeline must have at least four (4) layers (to be determined by the team) and a minimum of 12 events. Students must include notes for each event. One event must be the start of World War II. Major events of World War II may also be included but do not count toward the required 12 events. When completed, each team will provide — with the link to their timeline and the password. Students will work with a partner on this project. The due date is Wednesday, March 3rd. A social studies teacher assigned his students homework to make a Preceden timeline of the events leading up to World War II. It’s nice to see Preceden’s starting to get users outside of the startup scene, where is most of the traffic has been from since it launched a few weeks ago. PS: Follow Preceden on Twitter here. Posted on February 24, 2010 by Mazur. This entry was posted in Preceden. Bookmark the permalink.